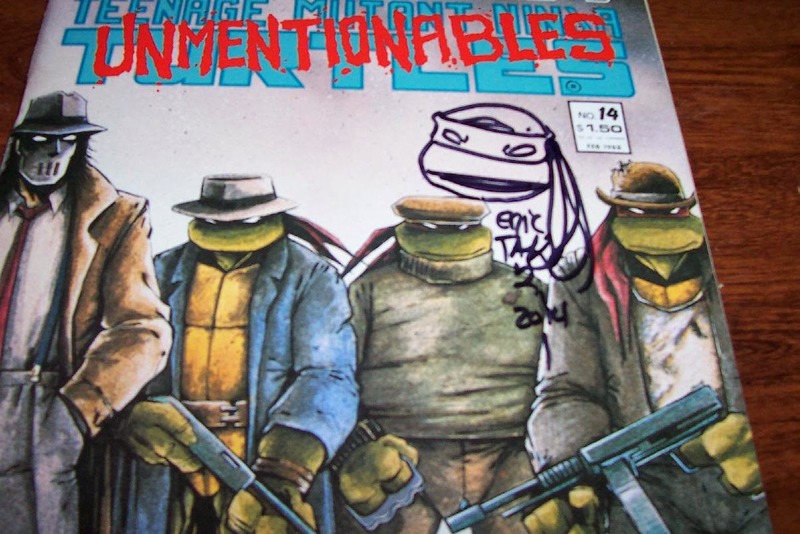 TMNT Entity: Pics from Heroes Con in Charlotte, NC! Pics from Heroes Con in Charlotte, NC! If you're wondering why there weren't any updates this weekend, or why it took 4 days for your comments to get approved, it's because I was attending Heroes Con in Charlotte, NC! I was working the We Love Fine booth on Saturday and Sunday (with Friday off to see the show). 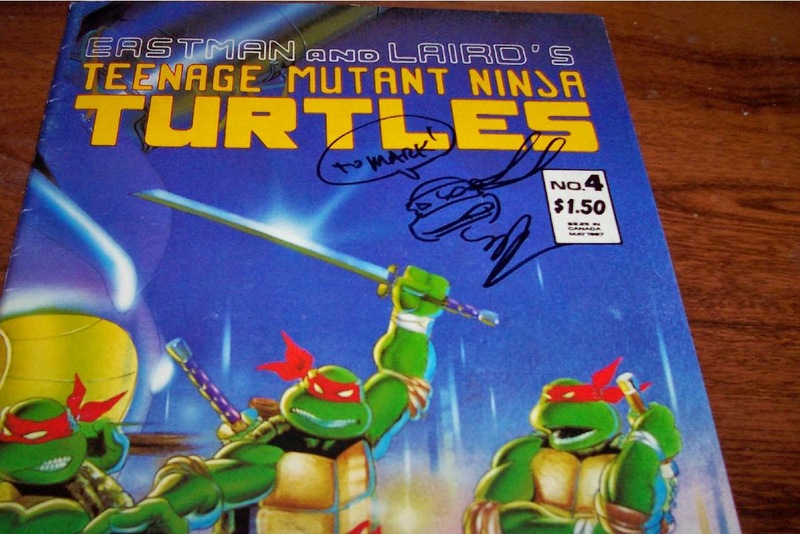 It was a great event and, in regards to this site, I got to meet a couple Mirage TMNT icons! I've gone on about it before, but that cover of his to the second printing of TMNT #4 (more popularly recognized as the NES game box art) is my all-time favorite Turtle piece. Now it's even better! Kevin Eastman was also at the show, which is why I had #14 with me, but my work schedule for the weekend just didn't align with his availability (I had Friday off to do the con, but he was only there Saturday and Sunday). Maybe another time. On a non-TMNT related note, I also got to meet another great in the world of comics. 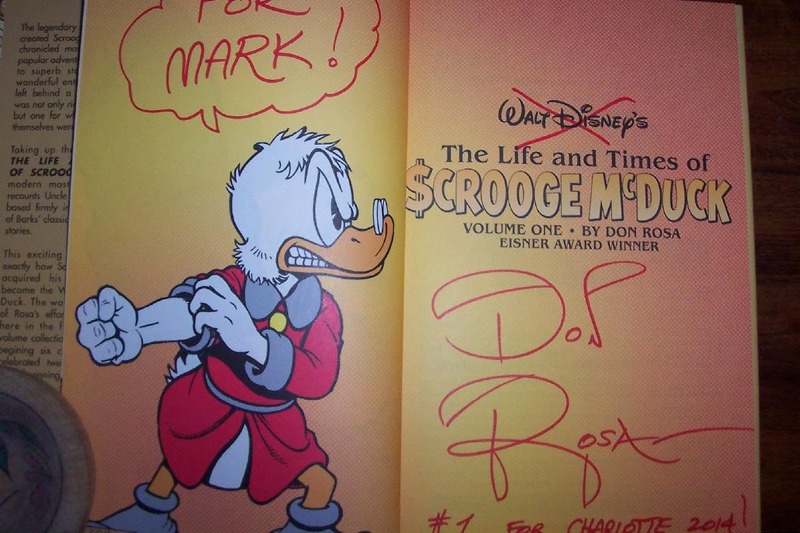 Incidentally, I was the first person at the Con to hit him up and he was happy to note that with a "#1 in Charlotte". It was a great show and I know a lot of Turtle fans were there beside me (there MUST have been, considering Eastman had the longest line in the place!). I hope everyone who attended had as much fun as I did and, if you've never been, it's a Con I'd highly recommend. It's a comic book convention that's actually ABOUT comic books. I thought they'd gone extinct ages ago. By the way, what did you think of the new movie trailer? There are elements I liked about it, but there mostly things I could see as having been strong in the script but troublesome in the visual execution. The humor of what we've seen from April's first encounter on the rooftop, for instance, feels like something that would have worked great if the Turtles just didn't... look... like that. Other elements I'm really kneejerking away from, but I'll at least see the movie and fully form my opinion from there. I mean, there are ideas from other incarnations of the franchise that superficially sound awful (the Shredder is an alien blob named Ch'rell, or the Turtles are actually reincarnations of human children from Feudal Japan), but the EXECUTION makes them work just fine when you sit down and watch/read the stories. The fact that the Turtles have nostrils and look like 4 Hulks rather than slim ninja's, and Shredder is a white man named Eric Sachs is enough reason to be wary of the film. Also what is with those awful glasses/goggles Donatello is wearing? Do we really have to stereotype him as "the nerd?" Story wise I doubt the film will be too hot either, I'm sure movie critics will tear it apart. Personally, the only part of the new realistic designs that bug me is the fact that Raphael has muppet teeth. Of course Donnie should look like a nerd. On every turtle dimension he was THE genius and also the nerd. Even in Mirage he became like that. I don't like the designs though aswell. But see no problem with stereotyping turtle characters. At least it's got Super Shredder.